How do I determine if I need the disk sizing that I need? Use the diagram below to determine which size disk you need. The .00 Inch disks are for cakes that shrink when baked. If you bake in a 6 inch cake pan, and your cake shrinks to 5.5 inches when baked, you do not want to purchase a 6.5 inch disk set because that will add too much icing. My Cakes Shrink - What Size Disks Should I Order? Typically, if you are using only Buttercream and your cakes shrink you should order the .25" sizing instead of the .5" sizing. If your cakes shrink a lot you may want the .00" sizing. 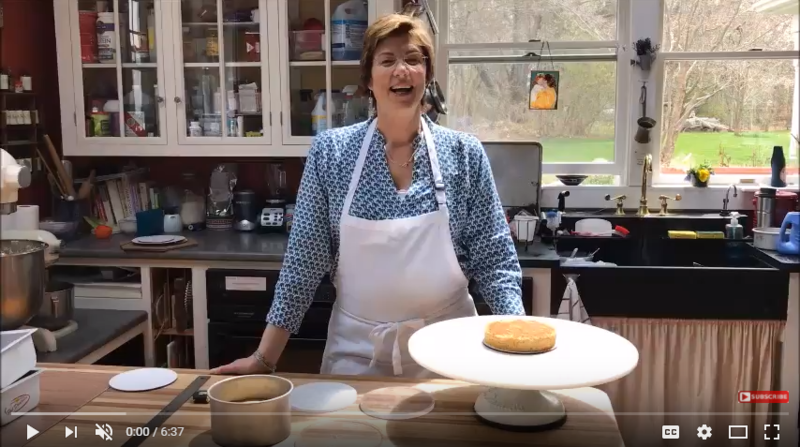 Measure your baked cakes and depending on how wide they are and how much icing you want to add to them you will determine the size disks you need. We can also make custom sized disks. Email info@cakesafe.com if you would like custom sized disks. Tips to prevent your cakes from shrinking can be found by CLICKING HERE. 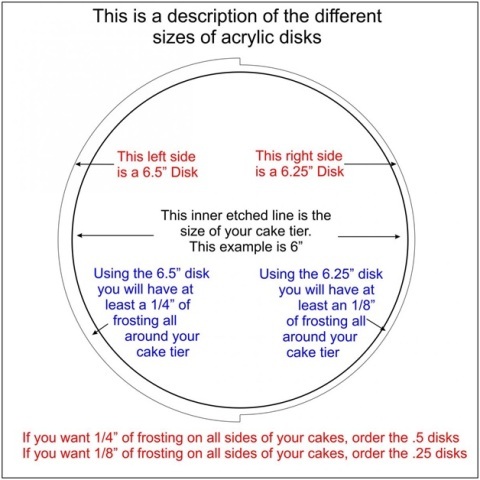 These Acrylic Disks allow you create a perfectly smooth finish on your cakes with buttercream or ganache to be decorated as is or covered with fondant. Kara Bustos (Sift by Kara) offers a full tutorial, and you can check out a preview here. The best way to care for your Acrylic Disks is handwashing them with soap and water. DO NOT use anti-bacterial soap on them as they will turn cloudy over time. Help! My disks are cloudy, how do I fix that? The disks will work just as well if they're cloudy and unfortunately, there is no way to remove the cloudy-ness. Are the acrylic disks and scrapers food safe? Both our acyrlic disks and our scrapers are made from PlexiGlas which is 100% food safe and FDA approved. What are the Work Boards for? We offer work boards made out of HDPE (High Density Polyethlyene) for use with the acrylic disks. You can see in the Acrylic Disk Promotional Video that she uses the boards as a working surface on top of the turntables. How do I use the Icing Scrapers? The Icing Scrapers can be used with or without the Acrylic Disks, and they are for scraping excess buttercream or ganache off your cake. You may have used an angled spatula or a bench scraper to achieve smooth sides on your cake, and the Cake Scrapers work the same way. They work particularly well with the Acrylic Disks, as the beveled edge of the Scraper rests against the top and bottom disks and scrapes off excess buttercream or ganache as you spin your tier on a turntable. You can see how they work with and without the Acrylic Disks in this video by Swank Cake Design.